Over the past two weeks we’ve discussed using data to drive your marketing campaigns and how to determine if you have the right data. Today we’ll look at the importance of combining data sets to effectively target campaigns. While the question may seem simple, the answer is much more complicated. This is because you need several types of data, including what your campaigns have done well and especially the information that will help you turn what isn’t working into something that is. You need data on which customer segments have responded and why, so you can understand what your customers want you to do. Start with your results. I find that one of the most important sets of data is Key Performance Indicators (KPI) and any data related to historic testing and performance. For example, let’s say current control package A produced a 1% response within MOSAIC macro cluster segment 1 and a 0.5% response to MOSAIC macro cluster segment 2. This information provides insight into what worked and what didn’t work for particular audiences and may give important understanding into who has been responding and who has not. Without this information, it becomes harder to identify what we still need to learn about how a customer wants to be communicated with and what we can do to improve the campaign. Even though KPI data can tell us a lot about response rates, it doesn’t tell us how to create a campaign that will generate better response. To really maximize results, far more data is needed. This is why you also need data on the customers themselves. The goal is to gain a deep understanding of the target audience and what motivates them. We want to understand what is currently known and then assess what else could be important to know. Such customer/target audience profiles could include demographics, psychographics, purchase behavior and relevant financial information. One of the best ways to get data on a prospect is to start by looking at current customers. Who has historically responded to a campaign or previous offer? What do they look like? Are they male or female? Do they have children? Are they homeowners? Do they have good credit? Do they have higher or lower incomes? These types of questions can typically be answered through data mining or customer research. The tighter the profile you can establish of an ideal buyer, the better you can target a similar prospect. The final step is to combine the data sets on your campaign results with those regarding your target audience. By blending that data and editing your campaign accordingly, you are able to approach your customer or prospect on their turf where they are more comfortable and apt to hear you. 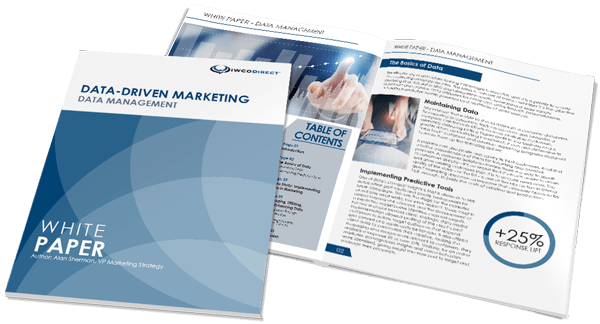 This will improve response rates and allow you to reach your target audience more effectively and efficiently. Data helps connect the dots between what you do and who the customer is. No single set of information will improve your responses; it takes a collaboration of many sets of data interacting with each other to form a bigger, more insightful picture. Our job as marketers is to put the pieces together to drive higher response rates. Please contact us to explore how you can use data sets to enhance your campaigns.